Published in the Dover Express, 1 August, 1980. The next change In New Bridge was the opening of Northampton Street in 1852. Up to that time there was a parapet on the west side of the bridge, over which there was a view of the open Pent. This parapet was removed, the arch of the bridge continued, and Northampton Street formed over it. Four years later, in 1856, Cambridge Terrace was built from Northampton Street towards the sea, the only building land then left in New Bridge being that enclosed by the blank wall between the river and Dr Sankey’s house. Nearly ten years later, in 1864, the National Provincial Banking Company, desiring to remove their bank from the pier into the centre of the town, acquired the plot of ground between the Dour and Camden Crescent, and No. 1 Camden Crescent was purchased for the manager's residence. The fine frontage inspired the banking company to erect a building having architectural features worthy of New Bridge. The designs, drawn by Mr Rowland Rees, were after the Corinthian style, having a portico pediment, supported by graceful columns, and other embellishments. The building was erected on the 2nd of March, 1865. 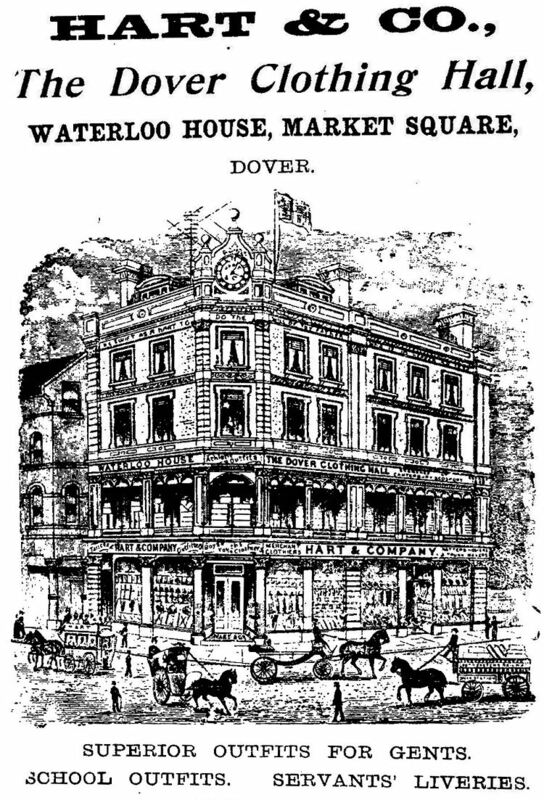 It is interesting to recall that this Dover branch is a continuation of Minet and Fector’s business founded at Dover by Stephen Minet in 1686, and disposed of to the National Provincial Banking Company in 1842. The bank's lease expiring in 1931 they acquired new premises at 1 Cannon Street, on the corner of the Market Square, buying "Waterloo House“ from Messrs Hart and Company. The bank is now the National Westminster Bank, which is a new building on the old site. 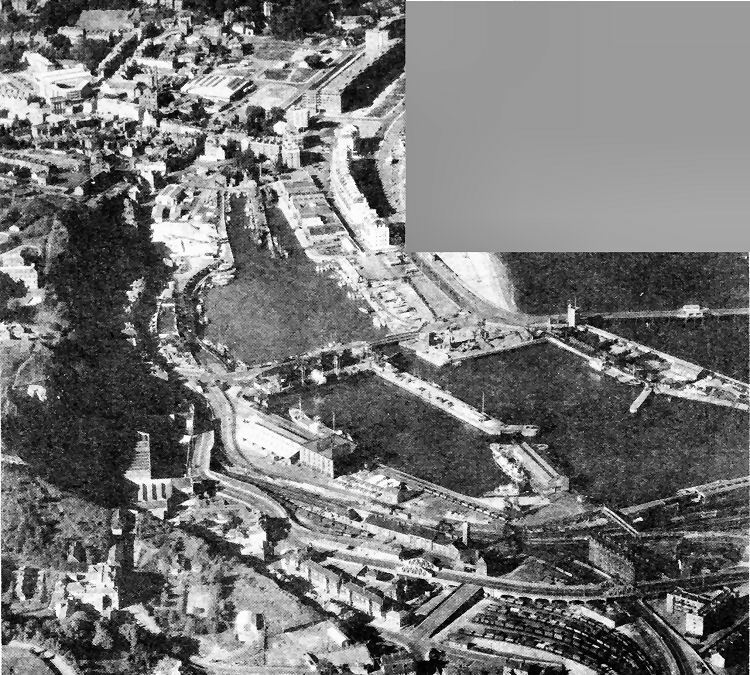 The old premises at New Bridge were taken over first by the Harbour Board, then Dover Corporation and finally Dover District Council, for use as offices. The Rifles’ Monument at the seaward end of New Bridge is a feature worthy of note, more especially as in this ancient town, with which so many great events and great men have been associated, we have so few public memorials. The Obelisk, which forms the centre of four roads, was erected in 1861 by the members of the 60th Rifles, in memory of their comrades who fell in the Indian Mutiny War. The name Mount Pleasant was long used for a small, lofty residential, area dominating a district under the Western Heights off York Street, including Military Hill, Cowgate Hill and Durham Hill. Above Cowgate, if we close our eyes and give rein to imagination, we shall see around us verdant pastures sloping up to the Western Heights, and a green rolling foot-hill to the north-west, around the hill westward from Cowgate is a winding track which beyond the Devil’s Drop turns over the Heights and along the cliffs to Folkestone; while at the base of the foot-hill a narrow lane leads up to the Dover Priory. The place was something like that at any time during the 13th, 14th, 15th 16th and 17th centuries. It was along that winding road over the Heights that the great gay cavalcade escorting Queen Elizabeth came in the autumn of 1573, entering by Cowgate, welcomed by a royal salute from the castle and the ringing of bells; and that probably is the reason why the thoroughfare below Cowgate is called Queen Street. At what time the builder first took possession of the pleasant uplands above the Gate, history telleth not; but, even as late as the year 1800 there was scarcely a building there to embellish or blot the scene. About that time, or probably earlier, a Mr Hartley built a fine old mansion called Prospect House, and conducted within its spacious rooms a school for young gentlemen, the academy being then surrounded by meadows, where later were built Portland Place, Hartley Street, Cowgate Almshouses, and Albany Place. After Mr Hartley, that academy was conducted by Mr Henry Crow, L.C.P., a learned gentleman who sought relaxation after his daily duties at Prospect House by delivering occasional lectures before the Dover Philosophical Society. After Mr Crow, his son-in-law, Mr Hutchinson, was for many years the principal of the establishment. State-aided secondary education put an end to the school and the premises became a home of rest for girls, provided for by Mrs Beresford Baker. Waterloo House, the premises of Hart the outfitters until the site was acquired by the National Provincial Bank, from an engraving dating back before the turn of the century. The changing face of Dover ... In the 20 years since this aerial photograph was taken much has changed. The Gateway flats were then only just being completed and workmen’s huts and stores Uttered what are now attractive lawns facing the sea. Victoria Dwellings and Seven Star Street flats on the right and the military hospital and South Front barracks on the Western Heights (left) were still standing, as were the Phoenix Brewery, off the Market Square and the Oil Mills, or Commercial Buildings, in Limekiln Street. There were no York Street or Town-wall Street dual carriageway, Russell Street car park was only wasteland and railway tracks and sidings still dominated the western docks area.